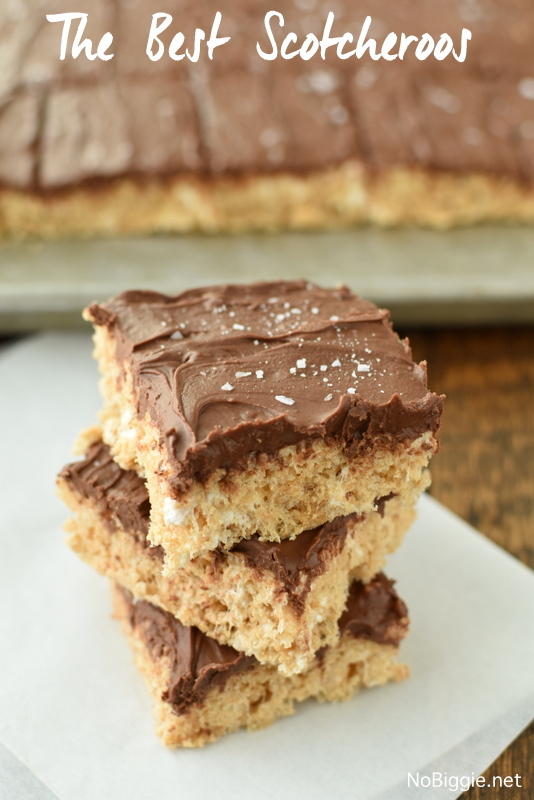 Classic Scotcheroos made with mini marshmallows for a more chewy texture on favorite treat. 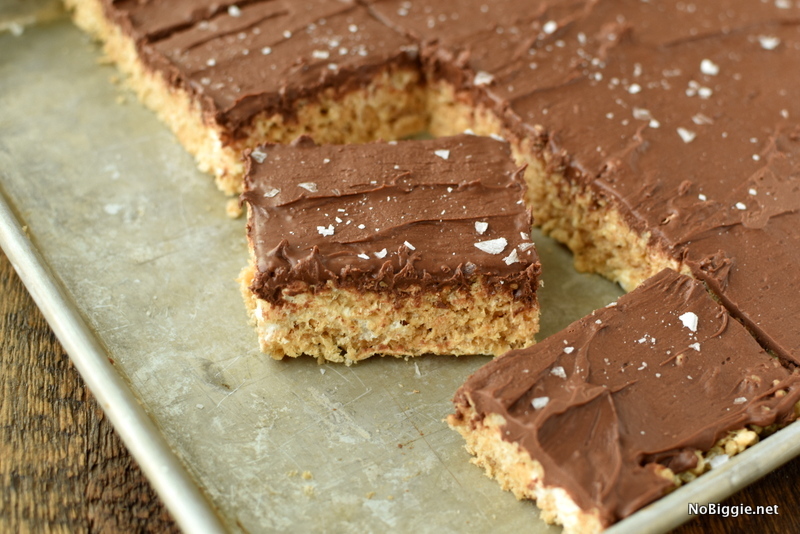 You guys…I’ve been making scotcheroos wrong for years! Scotcheroos are a family gathering staple around here. It was the first treat I was so excited to make on my own (in my little apartment) in college, and I messed it up big time! How does that even happen? The peanut butter rice krispie bottom was rock hard and then I scorched the chocolate butterscotch top. It was my first cooking fail and definitely not the last. I’m actually happy about it now, because I don’t think I would have remembered it if the recipe had turned out right. Anyway…this recipe is a classic and so easy, but sometimes some simple swaps can make all the difference. The biggest change to this recipe is to swap out the sugar and corn syrup for mini marshmallows. It makes such a difference in the chewy texture! Just like the best ever rice krispie treats, the marshmallow to cereal ratio needs to be 2 to 1 for guaranteed soft and chewy best ever scotcheroos. Also we add salt to the mixture and flake salt on top for such a nice addition. 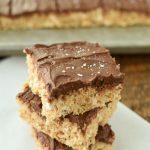 If you’ve been making Scotcheroos for years, I would love to have you give these changes a try and then come back and tell me your thoughts. I’m positive you’re going to love them. I snapped a few phone pics during the process so you can see them in progress. 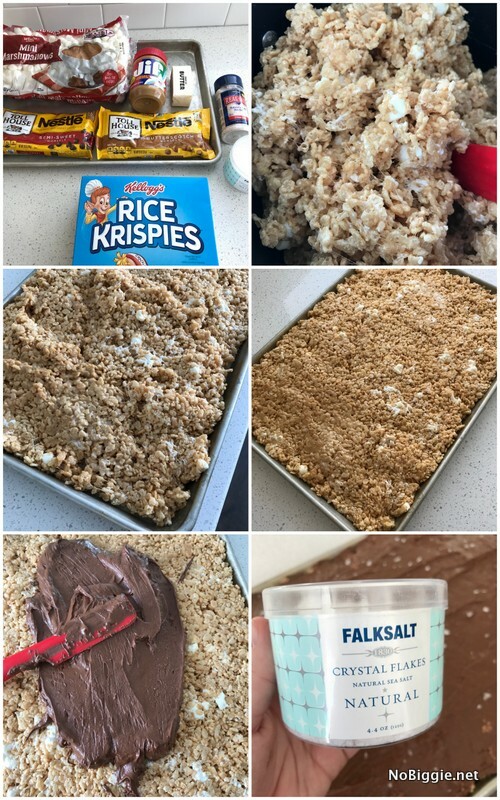 The 7 tips for making the best rice krispie treats come in handy for this recipe too. 1 box Rice Krispies cereal 12oz. On medium high heat in a tall pot on the stovetop, melt butter and coat the pan with the melted butter. Add the peanut butter, salt and vanilla and continue to melt and stir in with the butter. Add in the marshmallows, reduce the heat to low, stirring the mixture often. Pour in cereal and mix until evenly coated. Pour into a parchment lined sheet pan and gently press cereal mixture until flat with a piece of parchment on top to keep your hands clean. Once melted, pour chocolate mixture over the cereal treats. Sprinkle with flake salt while the chocolate is still warm. Place in freezer for 15 minutes until chocolate is firm. Cut, serve and enjoy! 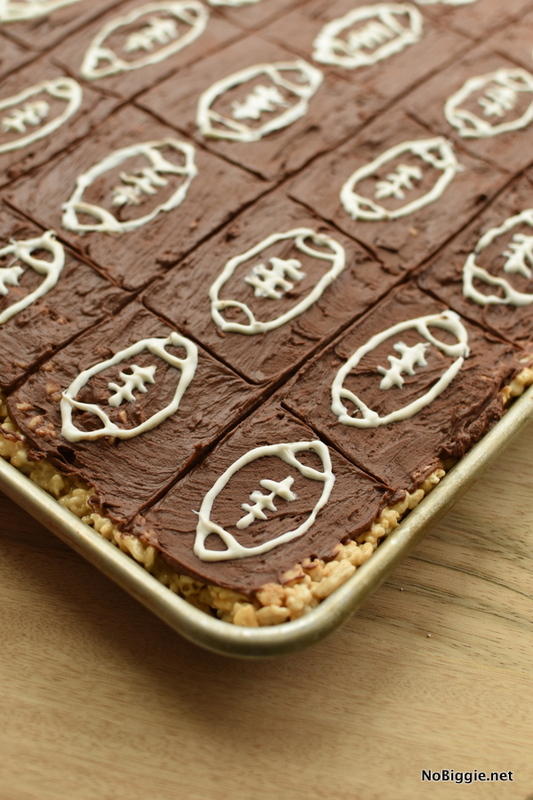 Here’s a fun way to serve up these scotcheroos for Superbowl Sunday or any football game gathering. We used the Bright White Candy melts to draw little footballs on each one. It helps to make score lines to divide them up before you start to draw the footballs on. Okay…I have to know…are scotcheroos a family staple for you too? If yes, do you make them with karo syrup or with mini marshmallows? I tell ya, they are so much better! What size is your bag of marshmallows? Hi Diana! The Mini Marshmallows come in a 16oz. bag (1lb.) So you will use 1 1/2 bags. We’ve made scotcheroos my entire life (Iowa farm food staple!). When I was making them for a recent work potluck, I couldn’t find a marshmallow based recipe. I know 100% for a fact that is what we used growing up, I even bought them at the store and thought I was going crazy when looking up recipes online. Glad I searched harder and was able to find your version! Oh good! I’m so glad you kept searching!